Those streaks that you see are harmless swirls of cocoa fat rising to the surface because when the chocolate was warmed, it lost its emulsion (like chicken stock or vinaigrette, which separates when heated, then cooled). Similarly, if there are crystal-like formations on the surface, those indicate ‘sugar bloom’ and the chocolate is safe to use. In either case, the chocolate can be melted and used as normal. If there is green mold, or anything furry, that means the chocolate got damp. In that case, it should be tossed. Contrary to what you may hear, dark chocolate lasts around five years. That’s in part due to the high amount of antioxidants, as well as the sugar, which is a preservative. Milk chocolate and white chocolate contain milk solids and should be used within a year. Technically nothing. Both chocolates must contain a minimum of 35% cacao solids by the Food and Drug Administration in the United States. Some manufacturers that make both will often call their sweeter chocolate “semisweet chocolate.” although it’s a totally arbitrary term and they can be used interchangeably in recipes. Bitter chocolate contains no sugar and is often called “unsweetened” or “baking” chocolate. In some countries it’s called 100% cacao since it’s composed only of ground up cocoa beans, and nothing else. Because bitter chocolate has no sugar and no added fat (cocoa beans are about half fat), it is more stubborn to melt and may be slightly grainy in custard and ice cream recipes. Often that can be mitigated by whirling the mixture in an electric mixer before cooking or churning it. There is so substitution of bittersweet and unsweetened chocolate for the other, although if you don’t have unsweetened chocolate, you can replicate it by mixing 3 tablespoons unsweetened cocoa powder with 1 tablespoon of vegetable oil or melted butter to equal 1 ounce of unsweetened (bitter) chocolate. Mix them together as a paste and you can use that for unsweetened chocolate in recipes. If you live outside the United States, unsweetened chocolate can often be found at baking supply shops. In Paris, you can buy it at G. Detou in bulk, and Lindt makes a 99% Excellence bar of chocolate that’s widely available, which can be used. Why does chocolate and liquid melted together sometimes become grainy? Chocolate is an emulsion, which means when you add something to it, and heat it, you break that emulsion. 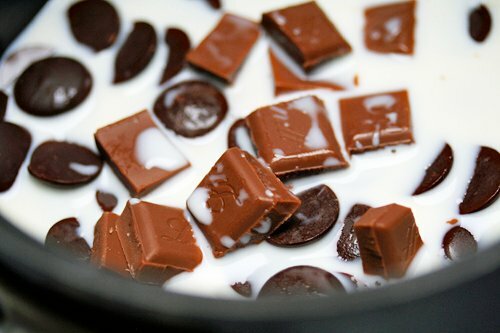 When melting chocolate, make sure you have at least 1 part liquid to 4 parts chocolate. So if you have 1 ounce of water and melt it with 8 ounces of chocolate, that won’t work and you’ll end up with a seized, grainy mass. 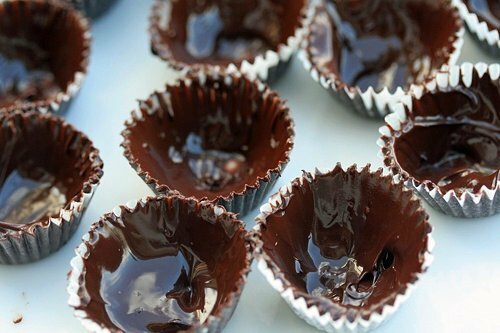 You need at least 2 ounces of liquid for 8 ounces of chocolate, or at least 1 part liquid to 4 parts chocolate by weight. Most commercial-brands of chocolate chips are made of baking resistant chocolate, formulated with less cocoa butter than standard chocolate so they keep their shape when heated. (Think of classic chocolate chip cookies with clearly-discernible chips.) If you melt them, you’ll often end up with a sludgy, thick pool of chocolate rather than one that’s smooth. Some recipes, however, may specifically call for melting chips and although I can’t vouch for every recipe out there, I advise people to follow the author’s advice. Also there are now many chocolate chips that are made from premium-quality chocolate, such as those from Ghiradelli, Guittard, and Scharffen Berger, which can be used for melting, as well as baking in cookies. Like the previous question, that’s very tough to say. Almost all cocoa beans are grown close to the equator, then shipped for processing, so there is nothing geographically advantageous if they’re processed in America, Belgium, France, or Switzerland. Most of the quality of the finished chocolate comes from the quality of the raw beans, their fermentation, then the roasting, grinding, and mixing at the factory. I also like to use chocolate extract, and add a dash to recipes along with vanilla extract (or in place of) in recipes. Some of the ‘top notes’ of flavor are lost when cocoa beans are processed, and chocolate extract replaces many of them. It’s a secret used by some manufacturer’s, and one whiff from the bottle is enough to convince you that it’s a secret worth sharing. What’s the Difference Between Dutch-Process Cocoa Powder and Natural? Can They Be Interchanged? In Europe, virtually all the cocoa powder is Dutched, whereas in America, both kinds are widely available. Companies like Hershey’s, Nestlé, Ghiradelli, and Guittard make natural cocoa, and Askinosie, a bean-to-bar chocolate maker, produces a ‘natural’ cocoa powder as well. European brands like Droste and Valrhona are good-quality Dutch-process cocoa powders. Where Can I Read More About Chocolate? Check out my chocolate guidebook, The Great Book of Chocolate, which is packed with information and includes some of my all-time favorite chocolate recipes! Speaking about chocolate, you should try the “Original Box” from Marcolini. 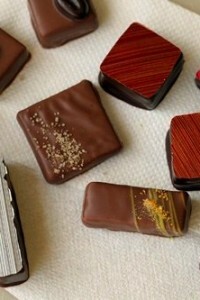 You get chocolate from six different origins at three different stages (grué liqueur and ganache). It’s a really nice way to compare the differences in taste between origins, and to understand the evolution from cocoa to chocolate. Thank you! I found that to be hugely informative! Always wondered about bitter vs. bittersweet chocolate. Thanks—I look forward to all of your upcoming holiday recipes & tips. What are the cookies piled up in the top photograph? They look fabulous. Any chance of a recipe? Great tips, merci! And your pictures are making me drool. I get Valrhona really cheap at Trader Joe’s, for anyone who is looking for it at a reasonable price. Thanks for the info about melting chocolate chips- I knew from experience they never melted smoothly like high quality chocolate, but never knew why. Now I can have a reason to cite when writing recipes. We’ve been making chocolate mole sauce a lot this year and Mexican chocolate is always surprising to me. So sugary! But I love the cinnamon. Have any baking recipes that use mexican chocolate? Have you tried Green & Blacks chocolate? It’s my new favorite, and their caramel bars quickly got me over a no-milk-chocolate policy that I’d had for a couple of years, so I’m curious how it strikes your palate as compared to Vahlrona, Guittard, etc. Holly: I have tried their chocolates. I do like their baking chocolate, sold in large tablets, but it’s unfortunately not available in France. Lesley: Trader Joes also sells 10# blocks of chocolate around the holidays, which is great to stock up on since it’s about $2/pound that way. And since it lasts quite a while, why not stock up? Or split it with a baker friend. Sara: That Mexican chocolate actually has it’s own category: It’s called ‘sweet chocolate’ since it has little chocolate in it. Still, I use it for things like mole as well. Haven’t had much success making hot chocolate with it, since it’s so sugary. I love the packaging. Thank you. As a relative chocolate ignoramus, this was great to read. I do have a question: why is it that my 65% Valrhona still tastes more chocolaty than higher percentages of other brands? Is it just my mouth? Judith: It’s because the percentage of cacao is a minor factor in the quality of the finished chocolate. Mostly it has to do with the quality of the beans sourced and how they’re treated after they’re harvested. The percentage just tells you the quantity of the cacao, not the quality. Too much cacao, if it’s poor quality, will taste less-chocolaty than a bar with lesser cacao that’s made with top-notch chocolate. I’m so happy you mentioned El Rey. We have a local grocery that sells chocolate rounds and I tasted all the varieties and liked a couple of the El Rey percentages the best for general baking needs. Guittard morsels are also a really nice substitute for Hershey’s and cost about the same. is a chocolate bar, only 4 oz but costs $2-3. They’re both 60%. I used to go with the chips because they were cheaper in terms of price per weight but eventually I realized that the chips don’t really taste as good as the bar. If you look at the contents, it shows that the bar does have more fat. David – Don’t knock Hershey’s products, which are wonderful. And living in Penn., there is also a locavore factor. I love it that you know this stuff! And I can only imagine how good your apartment is going to smell for the next two months. Do you have to bribe the neighbors with baked goods?? The only mention was that their regular cocoa powder, like Scharffen Berger’s, isn’t Dutch-processed. And that these natural cocoa powders needs to have an acid ingredient in the recipe to neutralize the soapy taste of baking soda. Perhaps that wasn’t clear, so I’ll clarify that. I have signed up for the newsletter 3-4 times already and have never, Never, NEVER gotten it. And now you’re sending out your all-time fave? Please somehow add me to the list! Thanks for all the great info! I have a recipe that calls for “Belgian dark chocolate.” Is there anything inherent to Belgian chocolate that I need, or can I ignore this and just get any good quality dark chocolate? And, would dark chocolate be equivalent to bittersweet chocolate? Zoe: Without seeing the recipe, I would say any chocolate labeled semisweet or bittersweet would be fine. Abra: I checked and your name is on the mailing list database (as an anti-spam measure, I can’t put people on there—folks have to do it themselves.) So I don’t know why you’re not getting them. I send a newsletter out about 4-5 times/year. In some cases, various internet providers block incoming bulk email, especially from overseas servers, so you may want to put , replacing the AT with @, on your safe list if there is on in your mail program. You can also check the mailing list provider’s website, and see if there’s an answer there. David, there’s a brand of cacao powder available only in Canada by the name of “Fry’s”. It’s supposedly amongst the best that’s available; however, I was curious as to whether or not you had ever heard of it and/or ever tried it and, if so, what you thought of it. Also, I made English Toffee last night and very carefully followed each and every step (waited until 305 degrees to add the vanilla – allowed toffee to cool for an hour before adding the chocolate and nuts – didn’t try to break into pieces for another 90 minutes) yet, when I tried to break the pieces up randomly using a rubber mallet (over Saran) the chocolate only bent. Do you have any idea as to why this would happen? Thanks very much. Do you have time to relate what the essential points are in making a light chocolate mousse? How does stiffness (or looseness) of egg whites and cream affect lightness of finished product? How does temperature of melted chocolate effect outcome? I know you are super-busy but if you could enlighten me I trust your opinion. paul: Yes, don’t overbeat the egg whites and/or cream for the smoothest mousse. Little bits of chocolate could indeed be because it wasn’t melted enough…or…if chocolate is overheated, little hard bits can form that never dissolve (they can be strained out). But it’s best not to overheat the chocolate in the first place. The best Chocolate Mousse recipe I’ve ever made is in Julia Child’s Mastering the Art of French Cooking, which has really good instructions as well. Lots of great info for enjoying all the nuances of that most luxurious food – chocolate. Conspicuous in its absence, however, is a discussion of the issue of fair trade. 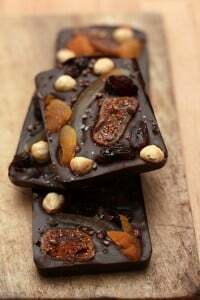 Chocolate producers have traditionally been taken huge financial advantage of by some of the most high end chocolatiers. I know I’m probably going to come across as a zealot, but to my mind those of us who possess the extreme good fortune of being able to enjoy such costly luxuries as chocolate owe a huge debt of gratitude to those (almost always improvrished) people who labour to produce such luxuries for our benefit. Please everyone, take the time to ensure that the chocolate you buy is fairly traded. There are more options every day for those with a social conscience – which should be everyone! Hi Jody: Thanks for the comment. Yes, that’s a pretty important concern, especially since cacao is grown in places that are quite impoverished and the people make very little money —which is why I always buy premium vanilla beans & extracts from a trusted source. When I lived in the US, I got my chocolate mostly from friends who were chocolate-makers, who sourced their own beans. For those interested in Fair Trade chocolates, in Europe Max Havelaar is the most visible of distributor of Fair Trade Products. In the US (and Europe), there’s a company called Alter Eco. Thank you for the chocolate tips! I love chocolate all year but holiday chocolate-teering is especially fun! All that baking and candy making!!!!! My daughter and I are going to start experimenting this week with dipping brownie bites (we have a great recipe!) in a Belgian chocolate we picked up at Trader Joe’s this weekend. We thought it might be fun to combine candy and baking??? We’ll see! OK, so while we’re talking about chocolate…are any changes necessary when tempering chocolate at high altitude (5,000 feet, let’s say)? I’ve adjusted my baking and sugar caramelizing pretty well but I can’t find any reliable information about chocolate tempering at high altitude, except that the dry climate probably helps. So far, my chocolate has come out more or less well-tempered (kind of like me). Do I need to make temperature adjustments? Thanks for all your sage advice, and the lovely picture of glossy dark chocolate. Mmmmm…. Hi Jennifer: For conversions on high-altitude cooking, I suggest you check out Letty Flatt’s site. She wrote Chocolate Snowball, a great cookbook on altitude baking and is a pastry chef pal who I turn to for conversions. Thanks for these answers David! I found the chocolate chips question/answer especially helpful since I probably would make that mistake! Karen: That’s a common problem now with people using high-percentage chocolates. My advice it to use something that’s more in the mid-range to start with. Once it’s broken, you can often bring it back by whisking in a few spoonfuls of very hot liquid, like water or espresso, until smooth. It doesn’t work 100% of the time, but I’ve done it a lot. You are not the best food blogger for nothing. That was one informative post. Thanks for taking the trouble to share. Perhaps a stretch for the FAQ’s… Can you (or anyone) recommend any good red wines that can pair well with dark chocolate? Thanks. Steve: I’m not much of a red wine drinker with chocolate. The tannins seem to cancel each other out. I recommend port with chocolate. It’s an exceptionally-good combination. Try it! My vet told me that chocolate is toxic for dogs, and that one ounce is fatal for a 40 lb. dog. He also added that baker’s chocolate is even worse for dogs than milk chocolate. What is the difference? Mly guess is that baker’s chocolate contains a lot less sugar and more chocolate; hence, being more potent for a dog. Could you tell me what the actual difference is. Thank you. Shelby: I’m not a vet, so it’s best to follow his advice. I suspect he meant ‘unsweetened chocolate’ by ‘Baker’s chocolate’, which is 100% cocoa mass (ground cocoa beans), as opposed to bittersweet, semisweet and milk chocolates, which are cut with sugar and cocoa butter. Bittersweet and semisweet chocolate have to have a minimum of 35% cocoa mass and milk chocolate has to have 10% cocoa mass, as required by law in the US. The percentage varies in other countries. So there’s much more theobromine in unsweetened chocolate, a respiratory stimulant which is harmful (and sometimes fatal) to dogs, especially small ones, whose systems are much smaller than large animals. Apologies if you answer this question elsewhere on your site, but I’m having trouble finding it. I’m planning to make your Caramelized Matzoh Crunch (I need to have at least one religious experience on Passover) and am wondering if, when I melt my 70% Ghiradelli, I can somehow make one batch of it into milk chocolate. Could I do so by adding condensed milk or powdered milk, or would it not harden properly after it cools? If it is possible, how much of either of those would I need to add per, say, 4 ounces of chocolate? 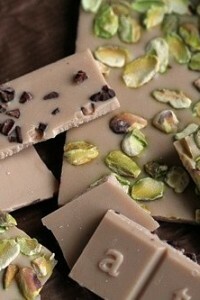 I realize I could just go out and buy another bar of milk chocolate, but experimenting is much more fun. :-) Thanks! btw, the only reason I’m using the “fancy” stuff is that I don’t want to spend more money on chocolate chips and have several bars of G. in the pantry… just noticed the recipe note! If you add any liquid to chocolate, unless it’s something like melted cocoa butter that is solid at room temperature, you can’t use it for dipping or enrobing. I don’t know about adding milk powder since I’ve never done it, but if you do try it, let us know how it works out. I have made chocolate frosting, to the recipe, to cover a chocolate cake but it is far too bitter. Is there anything I can do to make it sweeter? The chocolate used was Green & Blacks organic 70% cocoa. Debbie: You could use a chocolate with more sugar in it (less cocoa solids), or depending on the recipe, add more sugar or sweetener to it.